at the Cupcake Inspiration Blog! We were supposed to create a project based on this photo as inspiration! on these super sweet cupcakes!! I hope you like my design! That's it!! I used a Pink Prismacolor pencil to color her cheeks and a bit of shine to her lips! Love my Prismacolor pencils to add certain details! 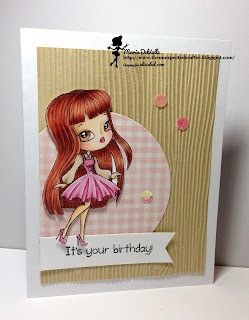 I hope you like my project and that you join us at Cupcake Inspirations for a fun challenge! !